Cask; Regular. Also available bottled. 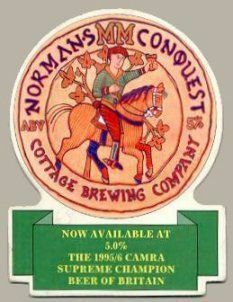 Available all year, Norman’s Conquest is probably our most well known beer. It is a barley wine at 7% ABV, which has gone on to become a world class ale, available in many countries in bottled form and in the UK in cask as well as bottle. Supreme Champion Beer of Britain, Conquest is brewed with Maris Otter pale, crystal and chocolate malts and hopped with Challenger. It is a full bodied, deep ruby beer with delicious hints of chocolate, bitter orange and vine fruits. A real winter warmer. Backlog rating from RBESG 2008, grand tasting: Brown, creamy head. Light sugary, dusty nose. Papery malt, light roast. Light body. Chocolate aftertaste. Cask at praf. Pours clear amber, nose is toffee, floral, taste is sweet, dry toffee. Bottle. Dark brown color with ruby hues, beige head. Aroma of roasty berries. Taste has dark roast, fruity coffee. Tasty. Deep beer pour. Toasty malt aroma with some light treacle and stone fruit. A bit of rich molasses and a soft touch of cocoa as well as some chewy malts. Really earthy and chewy with a bit of fruit on the back. Warming finish and a bit of hoppiness. Really delicious. Like a Christmas pudding. On cask at Congress, Longton. Pours dark muddy brown with off white head. Spicy, good hop tinge, chocolate and nice malt base. An excellent beer. Cask @ Trades Club, Hebden Bridge. Clear dark brown in colour with a creamy head. Has a lovely smoothness in texture and palate with sweet grainy malts dominant. Chocolate is is prominent in both aroma and taste, but much more stated in its nose. Cask in the White Cross, Lancaster. Pours chestnut with a cream head. Malt dominated with tea, coffee, biscuit and a little red fruit. Quite a dry finish. Nice. 23.11.2013. On tap at the Kings Head. London. Dark brown colour with off-white head. Burnt malty aromas. Light notes of dark malt. Sweet touch. Low carbonation. Malty soft light burnt aftertaste. Nice. Cask at The Haymarket. Pours clear amber with a thin white head. Aromas of orange and toffee malt, light biscuit. Quite a sweet taste, as you’d expect, and whilst relatively rich compared to a bitter, is thinner than most barley wine’s I’ve tried. Nice beer though.